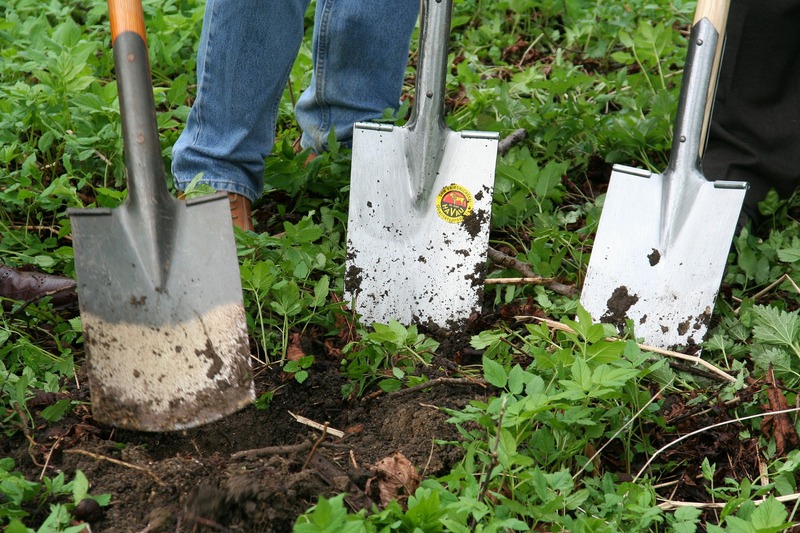 Digging and shoveling, even in loose, loamy soil, can be hard on the body. This is especially true for those of us whose stronger, more energetic days are in the rear view mirror. Unless we can hire help, having a garden means there will be trees and shrubs to be planted, soil aerated in the vegetable garden, and new beds dug in anticipation of flowers. Working hard in the sunshine and fresh air is enjoyable, until we overdo it. There are two ways to protect our bodies from the wear and tear that comes from manual labor. The first is to use tools that are lightweight and the right size for our bodies. The second is to use our bodies in ways that avoid injuries. Repetitive motion, vibration from power tools, gripping tools too large or small for one's hands and awkward body positions can cause pain, numbness and injury. They are the result of either improperly using tools, or using tools that aren't sized correctly for an individual's frame. Make sure a tool fits your body, that it isn't too large or too small. Out of proportion tools can cause injury and make a task more difficult. Look for tools that are ergonomic, that is, designed to be comfortable to hold and easy to use. A tool shouldn't be so heavy that using it will cause fatigue or strain. Look for textured handgrips to minimize clenching and keep hands from slipping. A "D" shaped grip allows you to vary your hand position. Look for large treads on tools such as shovels and digging forks to keep your foot from sliding off. Handle extensions or auxiliary grips can be added to tools to reduce the need for bending and stooping. Don't fight gravity; use kneepads or a kneeler, or sit on a low, stable bench when doing close to the ground activities. Keep tool blades sharp, and pruners oiled for smooth motion. Don't underestimate the value of well-made, well-padded leather or synthetic garden gloves. Consider them a tool, for they will reduce fatigue and cushion your grip, enabling you to work longer. In garden gloves, you get what you pay for. Quality counts, so skip the supermarket gloves and splurge on a good pair. Do vary your tasks and body positions. Don't twist from the waist; it's a sure way to injure yourself. Avoid awkward postures that can cause strain or set you off balance. Don't grip items tightly or torque your wrist when using pruners or other hand tools. If you need to twist your wrist to put more force behind a task, then the tool is too small for the job. Don't work with your hands above your head or your elbows above your shoulders. Do lift with your knees, not your back, and hug heavy loads close to the body to preserve your balance. Keep your elbows tucked in, and a slight bend in your knees when lifting. Don't stoop – keep a low center of gravity, bend at the knees and hips, not from the upper back. If your knees can handle it, squatting on your haunches is safer on the body than stooping. The lay of the land can work with or against your body when performing strenuous garden tasks. Let gravity work for you. If your garden has any kind of incline, stand or kneel on the higher side when digging and pile soil on the lower side. There are raised bed kits that reduce the need to stoop and bend, some high enough to work standing up. If the gardener can't make an adjustment, maybe the garden can.